Why are tsunamis sometimes much bigger than predictions based upon previous earthquakes, for a given location? Recent research has shown that wave heights may be enhanced when an earthquake triggers a subsea landslide, causing an extra release of energy into the water column. 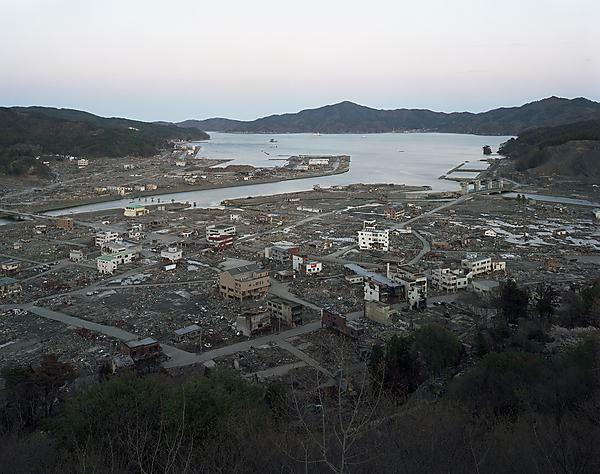 The Japanese tsunami in 2011 is an example of such an event, where the tsunami was originally thought to have been entirely caused by an extremely large earthquake of magnitude 9. However, later investigations found localised evidence for run-up heights up to 40m in the Sanriku area; these large waves were not predicted by the existing earthquake tsunami model. The British Geological Survey subsequently carried out an extensive geological and hydrodynamic investigation, concluding that the Sanriku waves were generated by a submarine landslide, which was caused by the earthquake shaking. To enhance our understanding of such events, experiments have been undertaken in the University of Plymouth’s COAST Laboratory. A unique 2D set-up has been developed to reproduce a dual-source tsunami generation mechanism. This consists of an actuator triggering a vertical fault rupture uplift, reaching accelerations of up to 4g, followed by the automatic release of the landslide which slides down a slope. Working with Alison Raby of the COAST Engineering research group are her PhD student Natalia Perez del Postigo Prieto, also supervised by Sarah Boulton from Earth sciences, and Colin Whittaker from the University of Auckland. The team has been assisted by Professor James Goff from the University of New South Wales, who recently spent a month with the investigators, funded by the Royal Academy of Engineering Distinguished Visiting Fellowship scheme. He has been giving an insight into what is understood about the cause and effects of combined earthquake and landslide mechanisms, particularly in the Pacific region. Images courtesy of Stephen Vaughan, Senior Lecturer in Photography at Bath Spa University. Stephen is working with Professor Iain Stewart from the University of Plymouth on ‘Seismic Sanctuaries’ - a collaborative project in Greece and Western Turkey exploring the relationship between ancient temple sites and underlying earthquake faults.